Hasan continued to fall away from the melee, his right lag dragging behind. “Watch their clubs,” the elf sighed to Stephan. “Poised or something. I never felt the like.” The elf pulled further away and turned. Summoning a bit of magical energy, he cast a dart at the wizened shaman. “Fare the well, madame,” the elf spat venomously. He started to draw his bow to follow the magical shot with arrows, but the gnolls were charging toward him so he drew his magical blade instead. The shaman had been caught off guard by Maruc’s spell. By the time she realized that her enemy was the priest across the field of battle, it was too late and it was her turn to fall helplessly to the ground. Her gnoll attendants tried to revive her, but to no avail. Rather than despair, they drew their weapons and charged into the fray. From within the mist, the sounds of the melee were dull and confused, which suited Ludo. His approach to the battle was silent and swift. Holding his sword low, he came up behind two Gnolls that were searching through the mist looking for targets to throw spears at. Ludo struck quickly, stabbing his sword deep into the lower back of the first Gnoll. It yelped in pain and crumpled to the ground, Ludo then spun to the left and attacked the second Gnoll with a series of savage blows. Feldard, ahead of the others, didn’t see Miklos collapse or Hasan fall back. He was surprised however at how resilient the gnolls were. There were few creatures he’d encountered thus far that required more than one blow of his axe to fell them but that only made this battle more exhilarating for the young dwarf. Stephan soon felt like he and the dwarf were alone in a sea of gnolls. The hide on these beasts was thick! The Traladaran felt battle sweat under his helm. He could no longer assist Feldard as he had only seconds ago but they stood back to back now, stabbing and hacking in a fury. A deeper, guttural growl cut through the battle din. As if climbing a mountain, Feldard and Stephan suddenly found themselves at the top, facing the massive gnoll leader. The other gnolls seemed to fall back a bit out of blood-respect for their leader. The mountainous leader squared off on Feldard. The dwarf was not intimidated in the slightest. Indeed, he was fully warmed up and engaged in the tide of battle. They exchanged several blows, steel crashed into steel. Despite the gnoll’s larger size, he was outmatched he dwarf’s armor, axe and battle-hardened determination. Feldard delivered a devastating deathblow to the gnoll, sending guts and bone across the misty forest floor. “Well met,” breathed Maruc as he absently crushed the skull of the crying Gnoll. 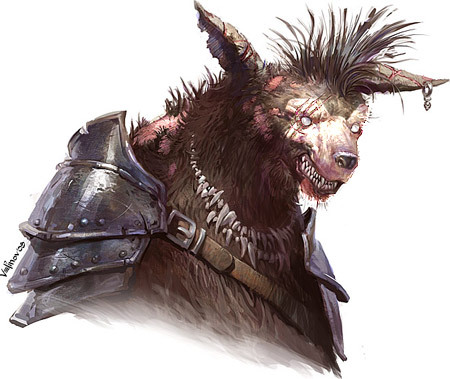 “You don’t look so good.” he spun and jabbed the end of his mace into the snout of a charging gnoll, blood spatted and it reeled back grabbing at its face. Maruc turned and grinned at the elf. “Don’t die on me, I’ll be right back.” the priest kicked the legs from under the stunned gnoll and roundhoused its shield knocking it off balance. He smashed his mace into its knee as it struggled to its feet. “There’s no escape from the might of Halav!” he cried. The cold hard damp stone Miklos had inelegantly collapsed on was deeply uncomfortable. He leg had folded beneath him at an awkward angle, again he cursed his bad luck as pins and needles flooded his leg. The battle ebbed and flowed in the mist he caught glimpses of grey shapes as they fought to and fro. The battle got quite close at one point and he had got trodden on but his leg was quite numb by that point to cause him further discomfort. At least the paralysis and stopped him crying out in pain. But, he thought, he wouldn’t have been under a battle if he had the power of movement. Blood flowed from a nasty gash on his shoulder – the Gnolls were tough fighters and were not prepared to give way. After running through his latest opponent Ludo looked around, the battle seemed centred on a whirling mass of blades and battle cries surrounding Feldard and Stephen. I doubt they need my help was the thought that flashed through his mind. Keeping low and with his sword extended he ran to Hasan. With Marucs spell of silence aiding his approach, his attack was deadly; an overhead swing deeply cleaved into the thick hide of a Gnoll, it squealed in pain and stagged away from the melee, life blood flowing from its mortal wound. The other Gnolls attacking Hasan were surprised by his attack and were stunned for a few vital seconds giving Hasan some much needed breathing space. The young dwarf, kept up his end of the battle; swing after swing, carving out chucks of gnoll flesh, dodging the attacks from the gnolls. If Feldard had been hit, he didn’t feel it – not yet anyways. Hasan watched Maruc, Stephan and Feldard strike into the mass of the gnolls with a ferocious impact. Their attack was so fierce, it seperated gnolls into individuals, and one of them came the elf’s way at speed! The din of the gnolls battlewail in his ears, the elf fired one arrow from point blank range, watching as the arrow buried itself up to the goosefeathers in his foe’s chest. But the dogman staggered into an attack nonetheless. Hasan dodged some, but not all of the club that whistled through the air to the elf’s thin shoulder. But the elf had managed to draw his sword. Standing between the gnoll and Miklos’s prostrate form, Hasan gathered himself and attacked, with a slicing feint to the gnoll’s shoulder quickly turning–through two whirls of steel too fast to see clearly–into a visious thrust into the beast’s gut. The dogman choked as he slid away from the blade, leaving only deep red arterial blood behind. Ludo slipped on some Gnolls entrails lying at his feet, as he slipped he felt a Gnolls spear glance off his shoulder but at the moment of impact a surge of power from his newly acquired ring softened the blow protecting him from serious harm. He gasped, the air was thick with death and violence, he could see Gnolls around him snarling and frothing at the mouth in melee with Hasan and Maruc. He saw Stephen fall under an avalanche of blows but could do nothing to aid him. Everything was slowing down, a Gnoll stabbed its spear at him again, Ludo countered but he could tell that his parry was going to be too slow and he braced for the impact. A new thought flashed through his mind, he was going to die here today! Fear of death renewed his sword arm, he fought through the pain and fear, with a cold fury that he had never experienced before. He slashed again at the Gnoll in front of him. If he was going to die then he would die fighting.